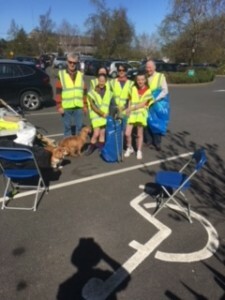 Again the sun shone for The Annual Mount Merrion Clean Up day. We had a good turn out of about 40, with lots of little ones being shown how to care for their environment. 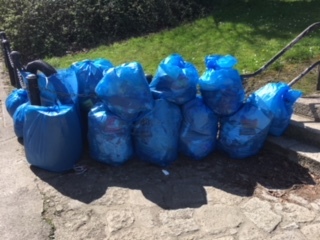 A dozen large Blue bags of rubbish were collected, the Council will collect them on Monday. Along with our Monthly Clean Up, on the first Tuesday of the month, we are keeping on top of the litter problem in the area. The hope is also that if the area is clean people will be less likely to dirty it. 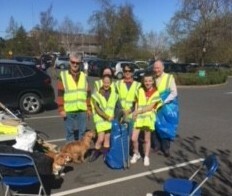 Thanks to Ed Maguire of Deerpark for providing free cones to all young participants and to Supervalu on the Rise who had a Manager and three lads cleaning the weeds and rubbish from the roadway from the roundabout to the shops. Three politicans, Deirdre Donnelly, Minister Shane Ross and Liam Dockery turned up to support our Community effort, many thanks.